Those who have appointed themselves to speak in the name of British Jews are determined to use any means to stop Corbyn. And they are not alone. 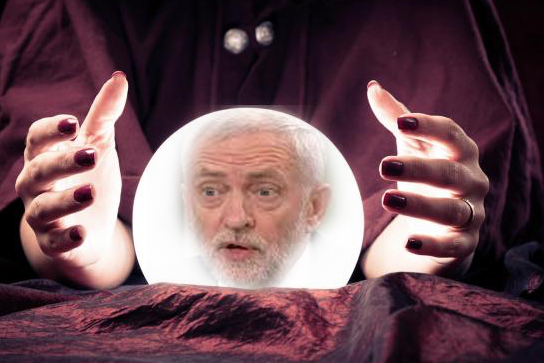 Now, we learn from the rabid Zionist Jewish Chronicle that Israeli born psychic and spoon bender Uri Geller is firmly committed to stopping the Labour leader from becoming our PM. Rabbi Boteach asked Geller if he thought his celebrity status might be harmed by speaking out and calling Mr. Corbyn an antisemite. Geller explained his support for Theresa May and the Tories to his Jerusalem audience. “It is important that she [Theresa May] stays in power because god forbid Corbyn should take her place,” Do I detect a hint of self-doubt in Geller’s statement? It sounds like the psychic doesn’t fully trust his own supernatural powers, nor does he seem assured by Roseanne Barr’s telepathic assistance. In the end, it is God that he asks to save the chosen people from the Amalekite Labour leader. As an avid reader of Jewish history, I would advise Geller not to put his trust in his creator. For some peculiar reason the Jewish God tends to take a holiday when his favourite people are in desperate need of divine intervention. My battle for truth and freedom involves some expensive legal services. I hope that you will consider committing to a monthly donation in whatever amount you can give. Regular contributions will enable me to avoid being pushed against a wall and to stay on top of the endless harassment by Zionist operators attempting to silence me.